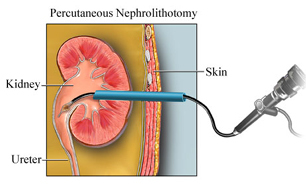 Percutaneous nephrolithotomy (PCNL) is a preferred treatment for large stones within the kidney or upper ureter. The procedure involves making a small incision (1 cm) in the back overlying the location of the kidney. A tunnel is then created from the skin into the kidney to allow passage of a nephroscope. The nephroscope is used to locate the existing stone and any small stones that may not have been visible by X-ray. The nephroscope has an inner channel that allows passage of instruments that are used to break up the stone. A wide variety of instrumentation is required for percutaneous nephrolithotomy. Each case will present unique challenges. It is imperative that instrumentation is properly selected to match the requirements of the case. A selection of Boston Scientific instruments can be used for percutaneous access to the urinary tract for stone retrieval and the establishment of nephrostomy drainage. In percutaneous nephrolithotomy or nephrolithotripsy, the surgeon makes a small incision in your back to remove kidney stones. He or she then puts a hollow tube into your kidney and a probe through the tube. In nephrolithotomy, the surgeon removes the stone through the tube. In nephrolithotripsy, he or she breaks the stone up and then removes the fragments of the stone through the tube. You need either general anesthesia or regional or spinal anesthesia during this procedure. A small tube (catheter) inserted into the kidney will drain urine until the kidney heals. Percutaneous nephrolithotomy or nephrolithotripsy successfully removes stones in the kidney about 95 times out of 100 and successfully removes stones in the ureter about 88 times out of 100. These procedures are technically difficult. A stone that has left the kidney may need to be pushed back into the kidney with a small tool (ureteroscope) before the surgeon can do the procedure.